Welcome to another Friday update. I thought I would start with a brief look at the reports that get filed around the world and how to interpret them and translate them into something that can be easily read and understood. VAA (Volcanic Ash Advisory) from the Tungurahau eruption last week. These reports can look quite daunting when you first look at them, but these are designed for the aviation industry to use in route planning so most of the data is aimed at planners and pilots. This is pretty self explanitory, This gives the information on the advisory itself and some data on the volcano in question. HYSPLIT. VOLCANO WEB CAMERA. GEOPHYSICAL INST. This next section gives the information on the actual eruption and the source(s) of the information. In this case, we have multiple sources for the data coming in. GOES-EAST – a weather satellite that covers North and Central America. Guayaquil MWO – is the Meteorological Watch Office observer from the nearby city of Guayaquil. GFS Winds – is the Global Forecast System that is used to predict the direction of any ash. HYSPLIT – another forecasting tool for ash dispersion. We then have a summary of the actual eruption. This tells us that the initial explosion reached FL440 or Flight Level 440 which is around 44000 feet or 13.5 km (Flight Levels do not correlate 100% in conversion to the actual height and you can read more about this here). Following the inital plume, we have “Emissions to FL240” which again means we have a plume reaching somewhere around 24000 feet. Next we have the data for planners giving the location and height of any observed VA (Volcanic Ash) and its forecasted movement over the next day or so. The final piece that interests us is this. which gives a more in depth summary of the activity by one of the scientists who has looked at the data. All this is translated into the graphic below for pilots. The Volcanic Ash Graphic or VAG takes the data from above and translates it into a visual medium for easy viewing by pilots. I hope that you found this information is helpful and more can read in the reports from the various VAAC reporting bodies (linked throughout the post). We now come to the main report. Colima continues its recent trend of activity sending ash into the air to 18000 feet on the 6th and sending a “puff” to 14000 on the 7th. This activity appears to have stopped for the moment following the events on the 7th of March. Momotombo is another volcano with a quiet week, the only activity reported by the VAAC was a possible Ash event to 7000 feet on the 5th and a hotspot visible in imagery. Volcano Discovery do report on the 8th that the volcano continues to have small to moderate “vulcanian type explosion” almost daily. Reventador has a couple of events this week with the local MWO reporting emissions to 16000 feet and a warning for aviation via an ASHTAM (special report of ash) reporting ash to 22000 on the 7th and a confirmed eruption on the 10th sending a plume to 20000. Colombia’s Ruiz volcano has had a number of eruptions around the 20000 feet mark with a “puff” reportedly going to 22000 feet on the 4th. Further reports of activity were made on the 9th and 10 with the local MWO reporting multiple times on activity, however there is no data attached regarding height of any ash. Guatemala’s Santiaguito had two events reported on the 8th and 9th, when ash was reported up to 14000 feet. Ecuador’s Tungurahua volcano has continued where it left last week with vigorous activity throughout the week. Most days saw a continuous plume reaching between 23000 and 30000 feet, with a larger explosion sending the ash up to 36000 feet on the 8th. Heading to Asia, the Dukono volcano in Indonesia continues its pattern of activity with a continuous plume at around 8000 feet every day, and up to 10000 feet on Thursday. Plumes were reported on the 4th, 5th and 10th of March from Bagana in Papua New Guinea. These plumes appear to have been short lived and reached around 7000 feet. A new entry into our reports this week with Manam, also in Papua New Guinea sending ash to 10000 over the 4th and 5th of March. Sinabung appears to have a had a quiet week, at least when compared to it’s normal levels of activity. According to the Darwin reports, plumes were produced only on the 5th, 6th, 9th and 10th, these were all in the 12-16000 range. I don’t want to go off on a tangent, but I feel this is the perfect point to bring this up. The Darwin VAAC reports are a mess. Every other VAAC has the activity reports labelled and filed by date, however the Darwin VAAC has a wall of text, with no labels or information other than the date. You may assume, as I did, that the IDD codes, might correspond to the volcano each report is referencing, however whilst I was rummaging the archives for this weeks activity I discovered activity at Sinabung that was under the IDD code I had assumed was Bagana! So a plea to the Darwin VAAC, please sort out your filing system to make it easier for others to use! Alaid had an eruption on the 4th/5th, that sent plumes up to 13000, and then everything appears to have gone quiet. Another new entry into our report is the Kuril Island volcano of Chirpoi. The Himawari-8 satellite suggests that there was an eruption from the volcano to 20000 feet on the 6th of March, before everything returned to quiescence. Another volcano that appears to be an ever-present in our round-up is Sheveluch. Over the 6th /7th of the month, plumes were reported from 14-16000 feet. Sakurijima appears to be returning to a quieter state with just one eruption reported on the 8th sending ash up to 10000 feet. The volcano was rocked by a number of explosions reported throughout the week. Strombolian eruptions were reported on the 4th, 6th, 7th and 10th, with a “continuous plume” reported on the 8th. We end our report with the only activity reported from the Buenos Aires VAAC. Copahue had reports of ash and steam on the 5th and 6th, but no further information regarding height, however on the 7th we had a repeat report of ash and steam and this also suggested that the plume reached 12000 feet. One thing I am learning from this is how eruptions develop. We tend to pay attention to sudden, short-lived events. But it seems a lot of volcanoes keep going for considerable time. It makes me think of Krakatoa which erupted for four months before its big bang. Eruptions come with history. Tarawera was the opposite,few hours to a few days at most observable activity at the most.How much extra warning with modern monitoring there would have been is a good question,maybe with an eruption likeTarawera not much more. Less than that even; it went from pretty much nothing to first felt earthquakes to full-on eruption to a VEI-5 over and done with – all between midnight and 6am! It was almost Hekla-like in the extreme rapidity of its onset. Krafla and Askja has an odd proven connection somehow. When one inflates the other deflates and vice versa. It was found out during the Krafla Fires and have been measured all the time since then. So when one has inflation type earthquakes the other soon after get deflation type earthquakes. If thats the case, he was probably one of the ones who actually understood what the bulge ment when it formed. In this age of reasonably good volcano monitoring ,a volcano would need to give signs that cause considerable alarm,possibly the last one to do this was Soufriere Hills or Pinatubo.Even Bardarbunga never reached that stage of extreme concern among those monitoring it to publicly announce it and no big explosive eruption was forthcoming.I guess the volcanologist track record in recent years has been good,or nothing has erupted in a massive fashion without significant precursors…yet? Let me point out that we have not had a significant eruption yet from a volcano that we have no track record for in the last decade. And, to confound things even more. Most of those that we have no track record for is not monitored, or badly monitored. So, there is still ample chance of us missing the next big one. Grimsvötn is a bit funny in that regard. We know pretty well what to look for in that volcano, but it is not a noisy volcano since it is erupting so often that pretty much all of the conduits are cleared and open all the time. Also worth pointing out that the deeper the magma chamber, the less warning we are likely to get. At the extreme end, a kimberley-type eruption may not give any warning at all, apart perhaps from a sound like an approaching express train. 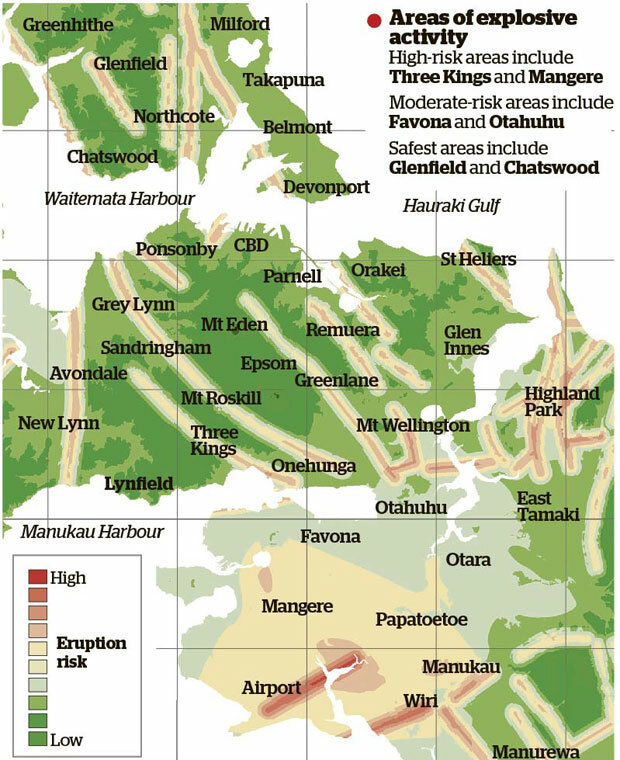 A potential future eruption from the Auckland volcanic field,is likely to be preceded by only a few hours warning and that’s right under a city of 1.2 million! The person who drew this map should be congratulated for getting the key colours about as perfect as could be – so that people like me (with normally unnoticeable mild deuteranomaly) can’t easily see a thing. Total amount of lava produced by Rangitoto,2300 million m3 or if my math serves me correctly 2.3km3 or nearly 1km3 more than at Holuhraun! and if a similar edifice developed in the city of Auckland ,what a disaster.I wonder what the gas levels were like from the Auckland eruptions,as anything close to the Iceland levels would make the city unihabitable? Against such complacency, one has to put forward the example afforded by Tarawera, NZ, in 1886 when some five cubic kilometres of basalt made its way from the mantle inside the space of a few hours. Another chastening experience is Rabaul in 1994 when the ground suddenly began to rise in the evening and by morning, when the inflation was 6 metres, the Tarvurvur and Vulcan stratovolcanoes on the opposing ends of the caldera erupted (VEI 4) to devastate the town. Luckily, the death toll was only five people as evacuations had been called immediately at the first signs. There were only 19 hours between the first signs and the eruption. Yes and it becomes more of a problem when you have to evacuate a large urban area.The balance between waiting for more evidence to ensure that a risky evacuation is not being done on a false alarm and giving as much time as possible to complete the evacuation in orderly fashion.What a tough call,most volcanoes that have erupted in recent times in spectacular fashion have not been in the immediate vicinity of a large urban area? Dear Hobbes, what an excellent post again, thank you so much! Great post. Thank you very much. Thank you for all the effort in collating the data. I realise there is not much of an ash plume generated, but do the Hawaiian volcanoes not deserve a mention for continuing to produce lava? Just found this absolutely spectacular video of a hike in the El Chichon Crater. Unfortunately, the guy seems to compete for a Darwin award…. Still, the crater visit part (starting half of the video) is stunningly beautiful, and competently filmed. A hop in the nearest bubbling volcanic lake would be irresponsible by Omer Simpson’s standards though (not to mention the sandals hiking). Another strong jolt a 4.8 in the strait of Gibraltar. This was mentioned here a few days ago. The Lisbon earthquake has nothing to do with Gibraltar: it is a different plate and different fault, and is a red herring in their article. Interesting swarm though. No herring in the Med. Otherwise, good point (very good!). English has quite a few words for flocks/schools/etc. How about a charm of quakes ? They set off their test volcano. I do not have a definite answer, but I would guess it was during Eyjafjallajökull. There has not been an eruption there for a very long time though. Part of the answer is up at your previous comment. I checked the GPSes and there may or may not be inflation at Krafla, but it has been going for a to short a time to tell really. There is also inflation over to the north where there was a persistent swarm a couple of weeks ago. An eruption at Krafla would be a true black swan since it is not Krafla season right now. I think this is more reverberations and resettlements from Holuhraun affecting Krafla and Askja. You’re right about the comments; seems to be a bug in the comments system. You reply to a specific comment – but after you post the system doesn’t ‘reset’ and if you go back to post a further comment – this time a new comment to the entire post – the comment still appears as a reply to the specific post you commented on earlier. Definitely not Krafla season I agree; it would be very out of sequence if anything happened there. Maybe an extension of the regional stress pattern through Askja etc. as you say. Or maybe purely hydrothermal; most of these quakes appear to be in or near the hydrothermal area just outside Myvatn. True, and we have some Bristlecone pines here that are quite long in the tooth as well, but this is an actual Oak stand that contains some members that are upwards of 900 years old. I’d say that is quite remarkable since I have three that I’ve either had to have taken down, or come down of their own accord. The one that was toppled by Hurricane Ivan caused me to have the other two taken out due to paranoia. Oaks are either tough as nails or fall down of their own accord. I particularly like that the Old Tjikko’s discoverer named the tree after his dog. 🙂 Leif Kullman is probably a very nice person. An article upon the subject of active mitigation of volcanoes!